Remember when I said I’d take a break from Holocaust stuff? I think you send a vibe of interest into the universe and queue stuff up to come to you – literally, though perhaps without intent. I just watched the Andrew Denton Who Do You Think You Are? in which he traces his family back to a town in Poland. 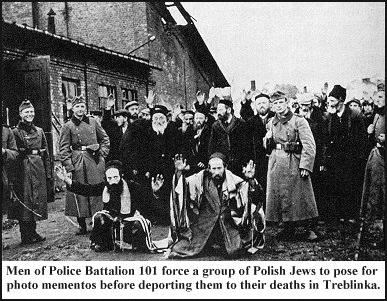 There he met a man in his 90s who spelt out the whole thing out to him – no, no one left, rounded up, forced to destroy their synagogue and holy books, forced into a ghetto, then transported to Treblinka. Andrew then travelled there and met the last surviving survivor of the, like, 60/800,000 (60 survivors from 800,000 prisoners brought to the camp). It was a straight-up death camp. You died within hours of arrival; they could and did kill up to 12,000 people a day. The man he met had been selected as slave labour – among the things he did was shave heads. The Nazis, he said, used the hair in the mattresses on submarines because it didn’t absorb moisture. True or apocryphal? Also in Poland he met the Chief Rabbi of Poland who showed him a book – a memory book of the town his family were from. There are 1000+ of these books, published in Israel after the war, filled with the memories of places the Nazis removed from maps, as Jewish places anyway – each filled with dozens or hundreds of stories of those who survived or had the good fortune of getting out while they could. Stories of the sorrow, grief, shock and anger but also melancholic remembrance of love and happiness. How do you deal with the descendants of people who did that? I get, and agree, that the sins of the father should not be visited upon the son. But how will I find Germans, Poles, etc. I can talk to about this stuff. I can’t just travel through remarking on the pretty countryside. That’s part of my fascination with them. What shadow is cast by the knowledge that your parents, grandparents, at minimum bore silent witness and more likely actively participated in some way. Not everyone’s grandfather dropped the canisters of gas but some did. I have to find some literature on this issue – descendants of Nazis talking about it.